Home > Shop By Brand > Griot's Garage Car Care for the Perfectionist > Griots Garage Wheel Cleaner 35 oz. Approved by the manufacturer of the world's finest luxury wheels! 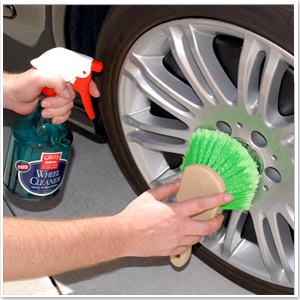 Griot's Garage Wheel Cleaner cleans wheels safely and effectively with a concentrated, biodegradable formula. BBS, the manufacturer of wheels for Ferrari, Porsche, and Lotus, approves Griot's Garage Wheel Cleaner for the cleaning of their high end wheels. Use Griot's Garage Wheel Cleaner on all types of wheels. Griot's Garage Wheel Cleaner is made from premium biodegradable ingredients and is safe for all types of wheels. More importantly, it's safe for you and the environment. Any wheel cleaner that touts spray-on, spray-off with no rubbing is a danger to you and our planet. Griot's Garage Wheel Cleaner's premium, pH-balanced formula cleans well yet is gentler on your vehicle and the environment. Griot's Garage Wheel Cleaner contains unique penetrants that allow for far less effort when cleaning wheels. The high concentrate allows the cleaner to hang on the wheel longer to clean stubborn brake dust, road oils and other deposits. This is a superior product with no expense spared toward the ingredients. Just a little mild agitation will release brake dust and grime from the wheel. Griot's Garage Wheel Cleaner is approved by BBS! BBS manufactures the finest wheels for most of the top automotive manufacturers in the world: Ferrari, Lotus, Porsche, BMW, Toyota, Audi, Volkswagen, Daimler, Chrysler, Jaguar, Mazda, Volvo, Mitsubishi, Subaru, AMG, Citroen, Opel, Pininfarina, Saab, Peugeot, and Alpina. BBS, Dayton Wire Wheel Company, and The Tire Rack have all approved Griot's Garage Wheel Cleaner for all of their wheels. If it's safe enough for the world's finest wheels, you can depend on Griot's Garage Wheel Cleaner to be safe and effective on your wheels! Griot's Garage Wheel Cleaner is safe on all types of wheel finishes. 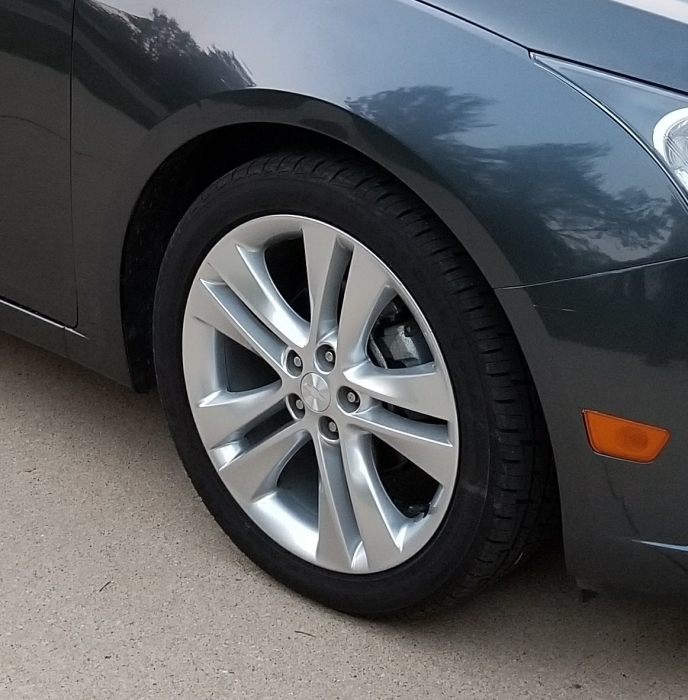 Use Griot's Garage Wheel Cleaner on cool wheels. Rinse the wheel with water. Spray the wheel thoroughly and use a Boar's Hair Wheel Brush to gently agitate the surface. Pay special attention to lug nuts and between spokes. Rinse well and towel-dry wheels to prevent water spots. No matter what type of wheels you have, you can trust them to Griot's Garage Wheel Cleaner. I bought this, spayed down two cars rims with a hose and then this product. I let it sit for 2 mins, scrubbed the rims with a microfiber...this detergent made the wheels sparkle and requires almost no scrubbing. The Griot's wheel cleaner, combined with their $2.99 wheel brush is amazing!! My wheels look better than when I bought the car!! I've used several similar wheel cleaners, but this product is the best so far. Used this wheel cleaner for the first time on some rather heavily soiled SUV wheels. After a little dwell time it it cut nicely through the brake dust and grime. Not as quickly or easily as stronger cleaners, but a little agitation with a brush still easily got the wheels clean. The trade off minimal extra agitation for a cleaner that is safer on the finish is worth it for me. The only thing that would make this cleaner better would be either some foaming action or make it a thicker consistency so it would cling to the wheel better. ProsGentle cleaner that does a good job even on moderately heavy wheel grime and brake dust. ConsMinor gripe - it could be foamier or thicker to cling to the surface better. This is the first time I've used this product. The task was fairly light duty as the wheels and wheel wells were not to dirty. However, using the clearer along with the wheel brushes resulted in a good cleaning fo the wheel wells and wheels. The Garage Wheel Cleaner seemed fairly benign and could possibly use Simple Green just as successfully. Will have to compare.